End of 1999: LAVANTGARDE talk with their later management about „the good old times“. Beginning 2000: LAVANTGARDE have their first gig ever since 8 years in Hannover. End 2001: The band play in Braunschweig as a surprise guest on Christmas day. Feb. 2002: They show up some new material and decide to publish their own CD on the SPR label. 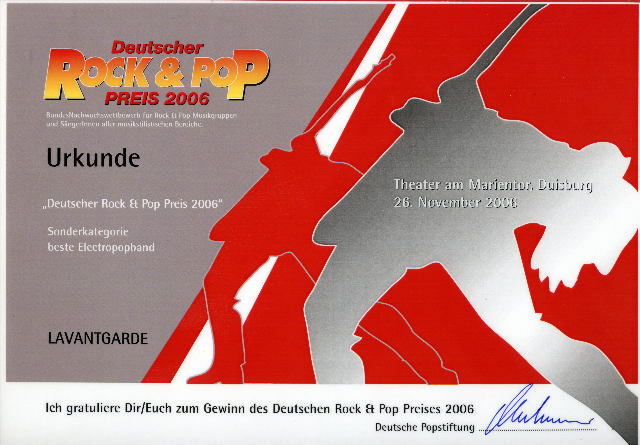 April/May 2002: LAVANTGARDE are special guest on the Alphaville Germany tour and present their CD „Musicment“. October 2002: Concert in Hannover . Some test recordings in a studio. July 2003: the recordings are finished. 2005 : Lavantgarde in germany in cinemas ! Yes, the clothes-store „Schwarzwaren“ chose Lavantgarde’s „Take me s.i.m.“ for their promotion-spot. Lorenz Macke (Label + Management) received the award. Powered by Graphene Mobile Neo.